A first-hand account as English, French and Russian troublemakers were involved in skirmishes. TEAR GAS FLOWING through the narrow streets of Marseille, fresh blood on the pavement and fans being punched so hard their heads hit the concrete beneath them. This wasn’t football. 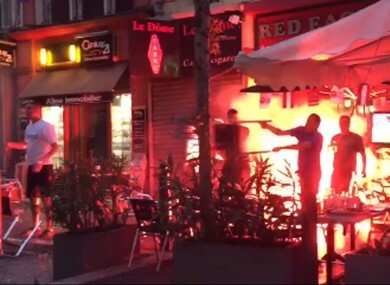 This wasn’t a peaceful night out in the south of France to mark the start of Euro 2016. Instead, it was a first hand showing of the taboo that many in football refuse to accept still exists: hooliganism at its ugliest. There was always a sense among the raucous England fans watching the latter stages of France’s Euro 2016 opener against Romania that an outbreak of violence was about to happen. The Vieux Port area has proved particular popular with England fans over the past couple days where several English and Irish bars are located. It became evident throughout the evening that an increased police presence was there following the previous night’s trouble. As the full-time whistle blew in the France-Romania game, beers began to fly in the air and England chants echoed around the streets. Scuffles started to break out before, out of nowhere, directly in front of me, an unsuspecting Frenchman standing next to a restaurant was knocked unconscious after being punched directly in the jaw. The violence didn’t stop there. Twenty minutes later, further up the road, I witnessed another person on the receiving end of a full-forced punch, which saw him land on the concrete beneath him. The majority of the violence centered around England, France and Russia fans, although the latter are expected to be completely outnumbered by 70,000 to 10,000 when Saturday’s match kicks off. One unnamed England fan who stood aside to watch the fighting unfold told me that the group of Russian fans had “turned up sober to fight” and “regularly fly to European matches” where they organise similar shows of horror. What struck me most was the complete helplessness of the French riot police to resolve the trouble as it occurred. At one point, they “kettlebelled” the supporters in to prevent them from going further down the streets to wreak more havoc. It certainly isn’t an understatement to say that the authorities were undermanned and under resourced when it came to controlling the hundreds of fans. Every other step taken while walking down the street was met with the sound of broken glass. Hooligans told me to ‘stop filming’ and at one point the powerful tear gas used to break up the violence had etched its way into my eyes and mouth. Another hooligan then squared directly up to a riot police officer, goaded him before launching a tirade of expletives in his direction. Thoughts immediately turned to 1998 when violence erupted among fans watching the England-Tunisia match on a big screen in Marseille. Chants included “no surrender to the IRA” being sung outside an Irish bar and the usual distasteful songs about RAF bombing Germans in World War Two. In stark contrast, a six-hour drive away would take you to Bordeaux where Wales and France fans united in a chant to celebrate Olivier Giroud’s goal against Romania. France interior ministry spokesman Pierre-Henri Brandet said that Friday night’s trouble “did not call security measures into question”. That statement is most certainly misleading and the events of that night in Marseille have exploited a rather worrying weakness in an under resourced army of police. Ninety thousand is the total number currently being deployed across the country, but the impression on Friday night was that there wasn’t enough. Worryingly, there could be more to come over the next 24 hours and beyond as England face their Euro 2016 opener against Russia at the Stade Velodrome. Hooliganism has never completely disappeared from the game and the events of Friday night have brought the ugly side of football fan culture back into the spotlight at a time when unity and respect is needed more than ever. Email “Bloody Marseille brawling: The ugly hooliganism eclipsing Euro 2016”. Feedback on “Bloody Marseille brawling: The ugly hooliganism eclipsing Euro 2016”.